On a clear day, the view atop Bradley State Scenic Wayside to the Columbia River is astounding! Picnic tables invite a longer stay in this prime day use site just off State Highway 30 near Astoria, but it’s the river view that begs closer inspection. 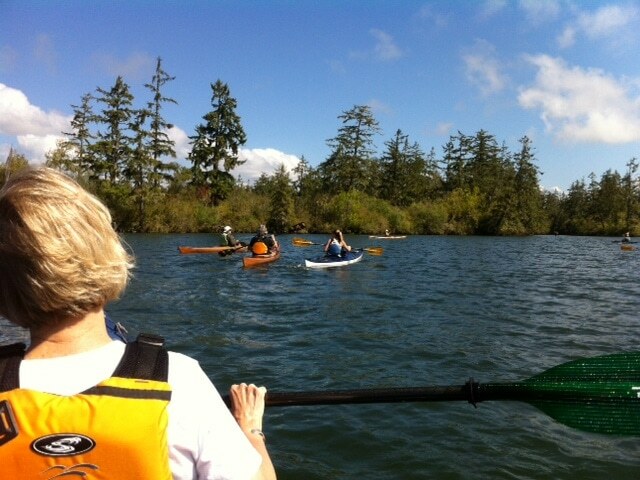 So give in and try something new with paddlers who gather to explore Columbia River backwater sloughs and islands. “Blind Slough” is certainly the ‘thick of things;’ it is Nature Conservancy Preserve of over 800 acres of soggy swampland with no land access. It is the last sizable intact Sitka spruce and tidal-influenced swamp forest of the Columbia River, a habitat type that once stretched from Tillamook Bay north to southeast Alaska. It is home to salmon, beaver, river otter, bald eagles and several other wildlife species. Fortunately, it has been protected by The Nature Conservancy since 1992. The swamp is a braid of channels, separated by acre-sized (or larger) islands. These are soggy places, reminiscent of some distant southern bayou, but of dense willow, alder, and immense Sitka spruce. Some trees rise 200 feet or more and are 400 or more years old. The native vegetation is a jungle so thick you cannot walk into the islands, but when paddling through the backwater sloughs inside a stable kayak, with time and tides in your favor, the travel is easy and pleasant. 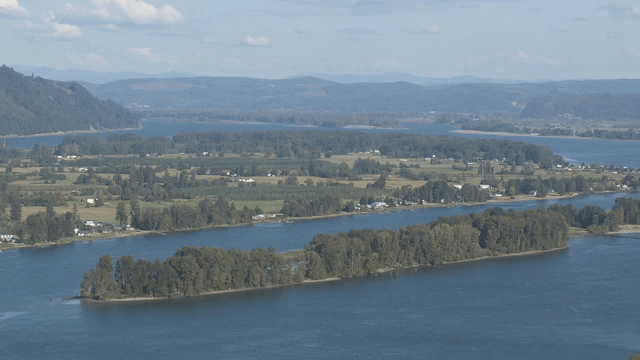 Historically, these areas flooded each spring from Columbia River runoff, so over time the silt built up and the islands grew larger. The big, old Sitka trees could take root and adapt to the moist soil. Along the southern edge of the Columbia River, water is washing through the preserve all of the time and that makes it a rich place for salmon, waterfowl, and the larger predators like osprey, bald eagles, and even bears. When you visit I hope you feel as I did: that despite a short 80 miles from Portland, you are in the middle of nowhere. There are very few places in western Oregon that allow that sense of escape and that feeling is not lost on the other paddlers in our small armada. Of all the different ways I’ve journeyed throughout Oregon, paddling is the most intimate way to touch nature. It’s easy and quiet, and you never know what you’re going to see: perhaps an eagle roosting in a towering spruce, or a beaver or muskrat cruising by, maybe even a pond turtle basking on a log in the warm, waning afternoon sun. Paddling offers time well spent in the Oregon outdoors. 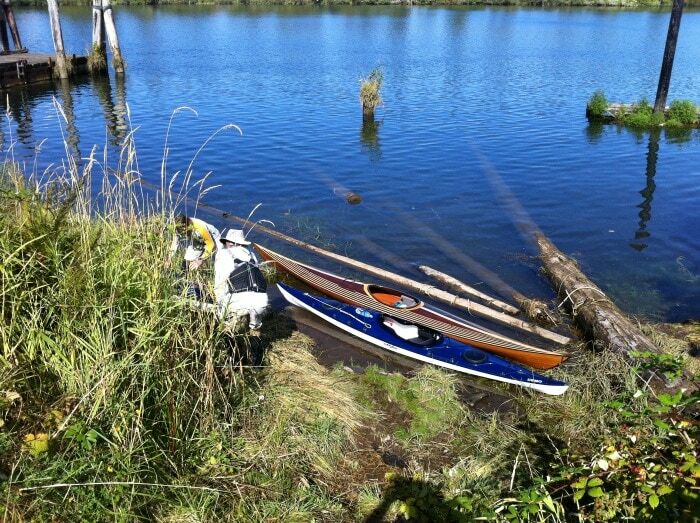 Note: Blind Slough is accessible only by canoe or small boat. The tides here can be strong and so can the winds. Please respect private property signs and avoid the log rafts. 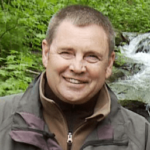 May, June, and September are excellent times to visit the Blind Slough Preserve. From Portland, travel west approximately eighty miles to Knappa Junction. Turn north at the Logger Café. In less than a quarter mile, turn right onto Brownsmead Road and travel approximately one mile to a junction. Stay left and continue north toward the river. Cross a wooden bridge over railroad tracks and go approximately a hundred yards to the Knappa docks for canoe launching.